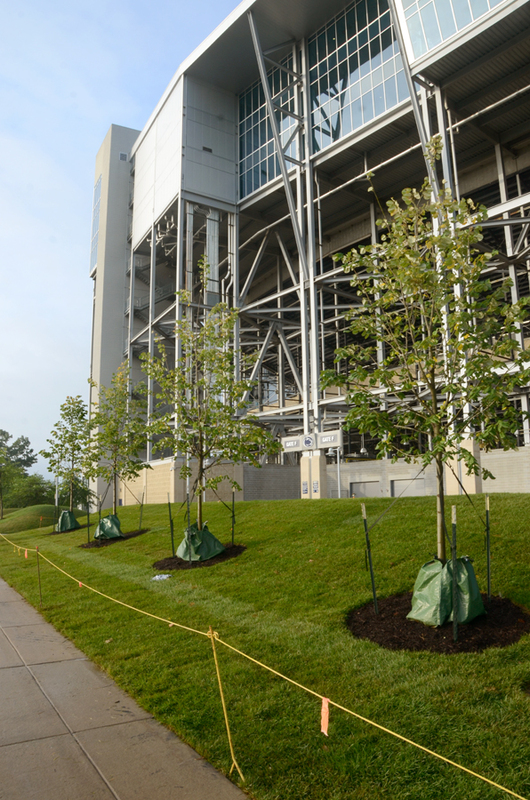 I’ve been driving by the former site of the Joe Paterno statue next to Beaver Stadium for the past week or so, watching the transformation from “statue/plaza” to “construction zone” to “grassy slope with trees, where you’d never know a statue once stood.” The project is pretty much finished now, and the fencing came down the other day; the photo at right is how things looked this morning. Below is a short slide show of seven photos I took, starting Saturday, July 21 (the last day the statue was standing) and ending this morning. Click on any photo to pause the slide show. You can see more photos at a previous post on the subject, and if you haven’t seen Lori Shontz’s account of the statue’s removal, I highly recommend that as well. Yesterday I spent some time talking with Brian Curran, a faculty member in art history who is fascinated by statues, monuments, and memorials, and who sees the controversy over the Paterno statue from multiple perspectives: as a member of the Penn State community as well as a scholar and historian. We’re hoping to include some of his thoughts in our next print edition, due out at the end of this month, and I’ll probably post a longer version of the interview on the blog as well. Entry filed under: Uncategorized. Tags: Brian Curran, Paterno statue. Unfortunately, I cannot see the pictures in the post, despite having a WordPress blog myself. Perhaps that is for the better, really. This sense of loss is not about “a statue” or “a football program” or “a token plot of grass”–it is the symbolism, the loss of community. Alumni are divided where once we stood united, together in common pride. Alumni leadership has splintered. Now we are shamed, implied guilty because we cheer for our university at “a sporting event.” We once gathered together happily in a family reunion of sorts. Now it seems like we desperately need it, some common safety rather than a joyous occassion. The grassy knoll, I’m sure, is lovely. I will see it at my first football game this year. Media will spin it to show that there is new life, new growth and a chapter forward, but I cannot help feel this is a token gesture. Was the past that we all grew up with really so dark and evil? Perhaps, but I refuse to succumb to the media’s interpretation until all (or at least more) of the FACTS are revealed. I wish those had come out as quickly as the burial of one man’s history was. That’s really odd. They appear just fine for the majority of people. I wonder if they require Flash Player or something. Or can you try a different browser?